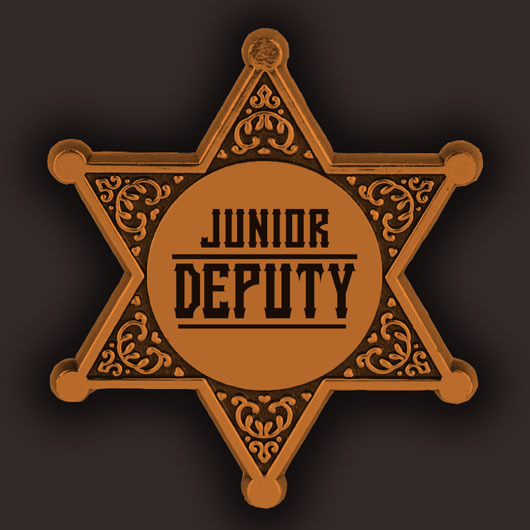 Our Wyatt style plastic Junior Deputy badge with shiny gold finish. Choose from the shiny silver Shield style Junior Police badge or the gold Wyatt Junior Deputy badge, packed 25 per bag. Orders usually ship out the next business day. With preprinted badges you get imprinted plastic police badges fast, in small quantities, and with no setup charges. Our badges are imported; imprinted in USA. style: Our preprinted police badges are offered in either the silver Shield style or the gold Wyatt style.